Are There Hair Transplant Side Effects? In the age of modern hair restoration, hair transplants reign supreme as the most effective method for fighting the effects of genetic hair loss. With results that are indistinguishable from surrounding hair and the ability to rebuild hairlines after years of thinning, many hair loss sufferers are interested in this comprehensive procedure than ever before. If you are considering hair transplantation surgery or have recently undergone the procedure, then take note of these common questions regarding hair transplant side effects. At Carolina Hair Center, Dr. Cooley and our expert staff will be with you every step of the way as you work toward rebuilding a thick and youthful head of hair. How Long Before My Scabs Heal? Scabs are a common and expected side effect of hair transplantation surgery. After harvesting the follicle grafts and transplanting them one-by-one in the balding areas of the scalp, the skin will need time to heal and recover. Scabs will develop in the first few days of recovery and will fall out around one to two weeks after surgery. While your scalp is healing, take great care not to pick or scratch off any of your scabs. The newly-transplanted follicles are very vulnerable right after the procedure and can easily be dislodged, negatively affecting your results. Dr. Cooley will provide you with specific instructions on how to care for your scalp and shampoo your hair right after receiving your transplants to ensure a healthy recovery and optimal results. How Soon Can I Return to Work After My Procedure? The answer to this common question ultimately depends on personal preference. If you work from home or have a job that does not require face-to-face interaction, then you may return to work as early as the day following your surgery. If you are self-conscious about your scalp and wish to remain conspicuous about your hair transplants, then we recommend waiting at least one week before returning to work. Some patients also opt to wear hats for the first few weeks of recovery to cover up their hair transplant side effects. Talk to Dr. Cooley if you are interested in wearing a hat since constant friction against the scalp may harm your hair transplants. Two to four weeks following hair transplantation surgery, you may be alarmed to see your newly-transplanted follicles begin to shed their hair completely. While it may seem counterintuitive, shedding is actually a normal and healthy part of the hair transplant process. The transplanted follicles will briefly enter into a resting phase as they settle into their locations and will shed their remaining hair. While your scalp may initially appear to become thinner in the first month, new hair growth will begin soon after. When Will I Start Seeing New Hair Growth? After the initial shock of the transplant process causes your transplants to shed their hair, new hair growth will begin around the three-month mark. You will see a visible change in your hairline around this time, although results will not truly be apparent until six to nine months have passed since your surgery. At the one-year mark, expect to enjoy a fuller head of hair. Results may even continue to improve for 16 months as dormant follicles begin producing new hair. At Carolina Hair Center, we understand the importance of a full head of hair for your self-confidence. With modern procedures, hair transplantation is safer than ever. If you are interested in an effective and long-lasting solution to your ongoing hair loss, then call Carolina Hair Center today at 704-542-1601 to schedule a consultation with Dr. Cooley and learn more. Dr. Cooley is the only hair restoration doctor in the Southeast accepted and recommended as a Hair Transplant Mentor™ Partner doctor. This is due to his extremely high standards of patient care and consistent, reliable results that continue to impress his patients worldwide. Dr. Jerry E. Cooley is recommended on the Hair Transplant Network. View patient blogs, photos and share ideas and advice on the Hair Restoration Social Network. Great source for credible insight & information about hair loss and restoration International Society of Hair Restoration Surgery. Share ideas on our sponsored Hair Loss Forum. Hair Loss, Transplant and Restoration Community advice on Bald Truth Talk. 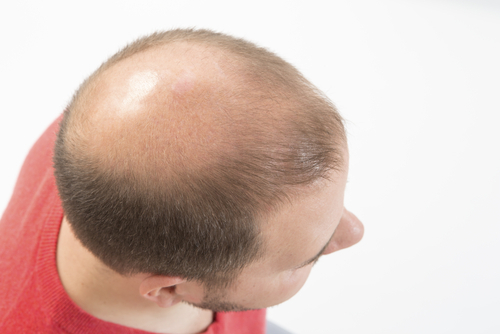 View Dr. Jerry E. Cooley's recommendation on the Hair Loss Learning Center. Effective January 1, 2019 Carolina Dermatology Hair Center will be transitioning to a hair restoration practice only and will no longer be offering dermatological services. The name of Carolina Dermatology, PLLC will change to Cooley Hair Center, PLLC. Read more!